Wow has this been a good week so far. 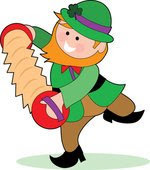 It is Happy Day time for letterboxers and the Irish. Wednesday it was finally warm enough to get out some. I started the day with a stop at "Spudnuts" my favorite donut shop. Then it was off to collect a recently changed local seasonally letterboxing which includes a bonus stamp. Another boxer beat me to it, but left a HH which I collected. Then a stop at a craft store to pick up some St. Patrick's Day trinkets. Some for my wife to wear at school and another to use as an "Easter Egg" in my own St. Patrick's day letterbox which I will put out before the week is finished. Following that I was able to plant three new boxes near my home. Then yesterday I got an early start. Not expecting the weather to get real warm, I went after a several drive-by boxes which are clustered close together some distance away. Before the day was done ten additional boxes had been logged. The weather actually turned out to be quite balmy. That is enough to make any letterboxer happy. Saint Patrick's Day is just around the corner. Today I will be cooking up pot of stew, but it will probably not be true Irish as my wife does not like the odor of lamb cooking. Here is a great Irish Soda Bread recipe that I wanted to share. It is traditional served with clotted cream (Devon Cream) and/or lemon curd. I recently found lime curd at a local store. The lime curd has a bit of a green tint so I will be using it instead for the big day. Preheat the oven to 400 degrees F. Line baking sheet with parchment or a silpat. Whisk the dry ingredients together in a large bowl. One tablespoon at a time, work in two tablespoons of the butter with your fingers, you will end up with a coarse meal-like dough. Stir in the buttermilk and the currants and mix with a fork until it comes together. Transfer to a floured countertop and knead just until the dough holds itself together, it will be bumpy, not smooth. This will take less than one minute. Pat the dough into a 6 inch round, 2 inches thick and place on the baking sheet. If desired, sprinkle with one tablespoon of sugar or two tablespoons of pearl sugar. Mark an "x" on top with a very sharp or serrated knife. Bake until golden brown, around 40 - 45 minutes. Remove from oven and let cool on a wire rack. Melt the remaining one tablespoon of butter and brush over the top of the loaf.